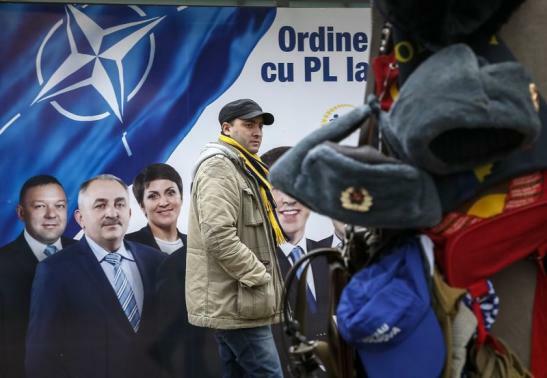 The Moldovan pro-EU parties have a narrow lead over those backing closer ties with Russia, the latest results from the country’s parliamentary elections show. With 89% of the votes counted, the three pro-Western parties have about 44%. The opposition has 39%. No party appears to be able to form a government, and tough post-election bargaining is predicted. The elections have taken on a wider significance in the shadow of the conflict in neighboring Ukraine. Moldova and Ukraine have signed far-reaching partnership agreements with the EU, bitterly opposed by Russia. On the eve of the vote, one pro-Russian party was banned from Sunday’s poll – a move criticized by Russia. Residents of the Russian-backed breakaway region of Trans-Dniester did not take part in the election. According to latest results, the three pro-European parties are set to have 57-58 seats in Moldova’s 101-seat parliament, while the two pro-Russian opposition parties are expected to hold 43-44 seats, reports say. The pro-Russian Socialist Party led with more than 21% of the vote. The Communist Party was in third with almost 18%. The party is a Soviet-era survivor that still uses the hammer and sickle as its symbol, although it is not seen as fundamentally opposed to EU integration. The pro-EU Liberal Democrats are in second place with 19%. The party wants Moldova to achieve EU candidate status by 2017 and full membership by 2020. Two other pro-Europe parties – the Democrats and the Liberals – are on just under 16% and 9% respectively. There have been reports that the pro-EU parties may now try to form a “grand coalition” with the communists to keep the country on the European track. Ahead of the Moldova vote, analysts said poll ratings of the Socialists, who want Moldova to turn its back on the EU and join a Russia-dominated economic bloc, had been boosted by their populist campaigning, including concerts by Russian pop stars. Turnout was just under 56%, the central electoral commission said, out of a total of 2.7 million eligible voters. Parties need to get at least 6% of the vote to gain seats in parliament.